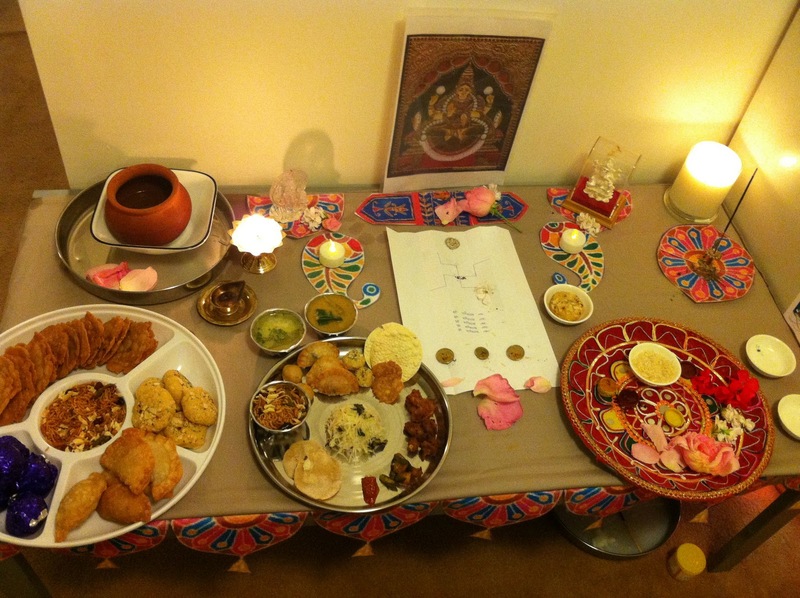 Here are some snaps from our Diwali Celebrations, I’ll post the recipes later. We don’t have a pooja room at home, so we decorated the coffee table with cut-outs printed out from the net. The Pooja thali is from our wedding, the coins, agar bathi holder and idols were gifts from the family. We also bought a new brass lamp from the temple. It looked really beautiful, considering it was only a make-shift pooja table. None of us could sing bhajans in tune (I don’t even know the words!) – so youtube came to the rescue. We played a clip in the background, and Mangy and his brother did the Aarti. 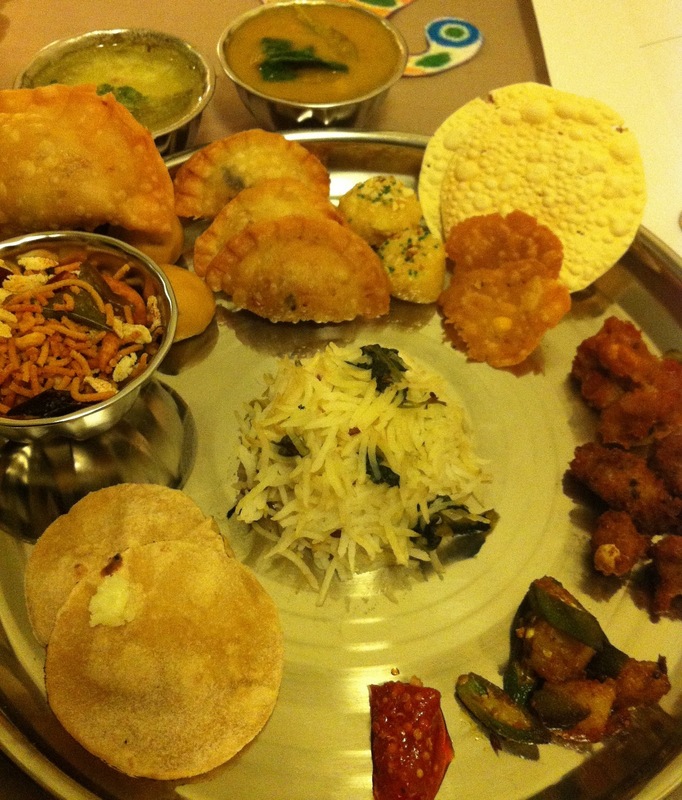 We made up a mini thali of food for the pooja, and it was tiny and really cute. The mini Karanjis were only a third of Mangy’s finger. In the pic, you’ll see a regular sized karanji right at the top – if you use that a scale, you’ll be able to judge just how small this thali was. It was so adorable. From the top, moving clockwise, we’ve got Karanji, Cashew nut Paal Goba, Pappadams and Thattai Murukku, Rasam Potato, Dal Vada, Okra and Potato Masala, Pickle, Mini Rotis, Sev Mixture, Nei Urundei, Jeera rice (in the middle) and in the bowls we have Kadhi and Spinach Dal. 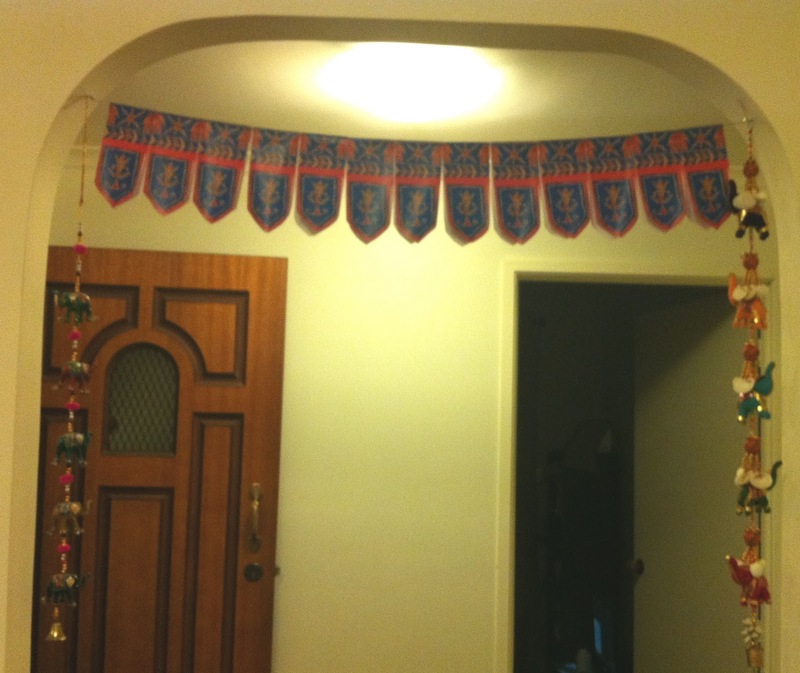 We didn’t have any thorans, so we printed out multiple copies of one thoran leaf and stapled them together on some string. 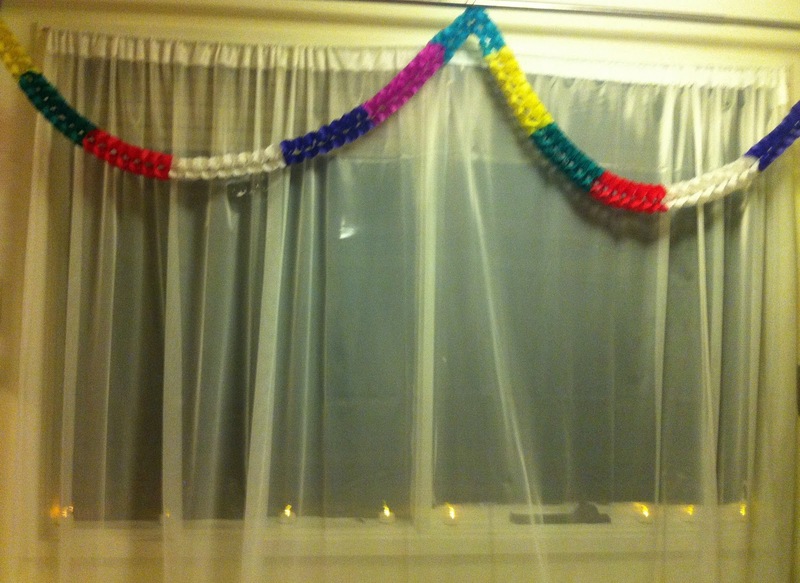 In close-up, the detail was blurred, but on a string, they looked pretty much like the real thing. The tea lights were battery operated; we got them from Target – a safer alternative to oil-lamps, especially near curtains and they flicker just like real flames.